On January 31, the Lemelson Center in collaboration with Cricket Media launched its 7th annual invention competition. Not only does it offer students the opportunity to develop important skills like problem solving, critical thinking, and collaboration, this year the challenge also honors the legacy of an inspiring inventor. Dr. InBae Yoon (1936-2014) was a Korean American inventor who passionately believed—like we do—that everyone is inventive. His love of inventing sparked his lifelong commitment to drawing, tinkering, and prototyping his ideas, which resulted in over 200 US patents. The Spark!Lab Dr. InBae Yoon Invent It Challenge celebrates his legacy as an inventor and educator and aims to inspire the next generation of innovators. Dr. Yoon was born in Korea in 1936 during the Japanese Occupation and grew up through the Korean War. He attended the Yonsei University School of Medicine and graduated with his medical degree in 1961. Soon after, Yoon immigrated to Baltimore, Maryland where he conducted his internship and general surgical residency. During his residency, Dr. Yoon switched his training from general surgery to Obstetrics and Gynecology and became fascinated by laparoscopy — a method of surgery performed using a scope placed through a tiny incision in the body. At the time in the 1960s, this method was considered a new and risky kind of surgery, but Dr. Yoon saw its future as a safer technique with the benefits of shorter recovery time and less scarring for the patient. He strongly believed that even complicated surgeries could be performed this way. This conviction sparked in him a lifetime passion and creativity to invent new surgical devices. After endless nights of drawing, redrawing, and tinkering, the US Patent and Trademark Office awarded Dr. Yoon’s first patent in 1975 for the applicator device of the Yoon Ring (US Patent 3,870,048). Dr. Yoon could see further potential for the use of laparoscopy in many other types of surgeries beyond OB/GYN. 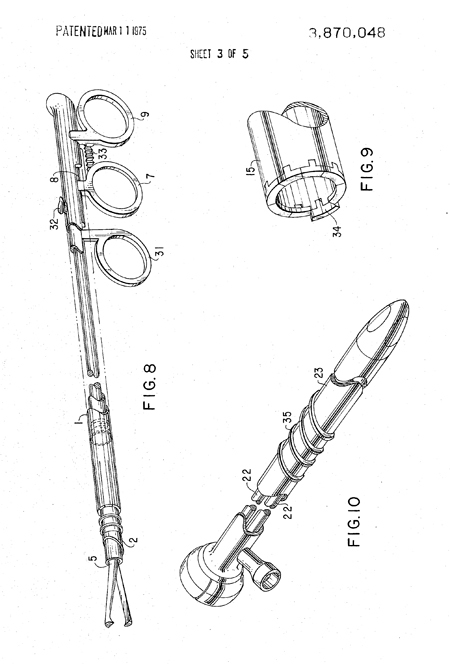 He spent the next 30 years inventing laparoscopic devices for general surgery, including needles, sutures, clip appliers and trocars (a small tubular port through which keyhole surgery is performed). Dr. Yoon worked independently until the late 1980s when he began his partnership with Johnson and Johnson’s subsidiary Ethicon Endo Surgery. During this time, medical instruments and techniques for laparoscopy and endoscopy expanded widely, fulfilling Dr. Yoon’s lifelong dream. Today, as he predicted, minimally invasive techniques are used regularly and are considered the safest option for many surgeries across multiple fields of medicine. After Dr. Yoon passed away in 2014, the Smithsonian’s National Museum of American History collected many of his surgical instruments and prototypes, along with his personal and professional papers. These items are now in the museum’s research collections and available for scholars to study, ensuring that Dr. Yoon’s work can continue to inspire future generations of inventors.